Julian Ashton was particularly adept at conveying the open spaces and clear light of the Australian landscape in his watercolours, a medium well suited to painting 'on the spot'. 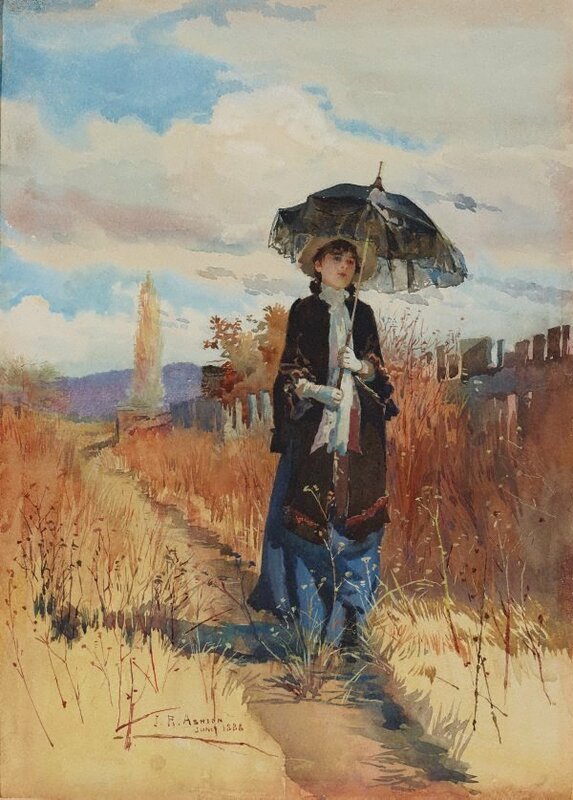 'A solitary ramble' is one of the best known watercolours in the collection. Its depiction of leisured, rural life in nineteenth century Australia reflects the growing sense of national pride that was evolving in colonial society, which formed an identity closely associated with the bush. The female figure with a parasol is the artist's wife, shown in a lane behind Griffith's Orchard in Richmond, near Sydney, NSW. Signed and dated l.l., watercolour "J.R. ASHTON/ JUNE 1888".